What’s the difference between a Living Will and a Do Not Resuscitate Order? A Living Will tells the world whether you want to be kept alive in those specific circumstances. The choice is yours. A Living Will also authorizes others to communicate your wishes if you are not able to do so. 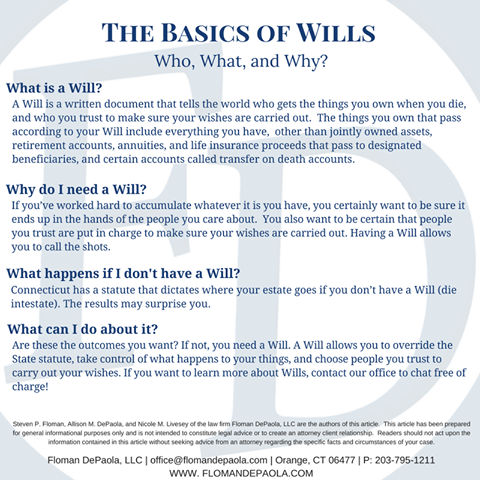 A Living Will can be prepared by an attorney, or any other knowledgeable third party. A Do Not Resuscitate Order (commonly called “DNR”) means you don’t want the application of efforts to resuscitate you using methods such as CPR, chest compression, defibrillation, mouth to mouth or mouth to mask, ventilator or any similar medical procedure. A DNR order can only be authorized by a physician. You, or someone authorized to act on your behalf, of course, must approve the DNR order, in writing. You are in reasonably good health and have a heart attack at home. You have a Living Will. Some type of resuscitation is required to keep you alive; it will be administered. You are in extremely poor health, have lost lots of your mental acuity, and have been in and out of hospitals for many serious medical conditions over the past few years. You have a heart attack at home. You have a Living Will. Some type of resuscitation is required to keep you alive; it will be administered. Same facts as example 2 except you also have a DNR order. You will not be resuscitated. If you are interested in learning more about these types of advance medical directives, please visit our website and read our blog for recent posts. For advice specific to you or your family, please contact the office. We would be glad to meet with you for a no hassle, no charge initial consultation, no matter how long it lasts. Do you have questions about Connecticut Wills, Living Trusts, Probate, or Long Term Care? We often write about Wills, Living Trusts, Probate matters, and other legal topics here on our blog and in our social media. This Spring, we’re offering classes so that we can review these topics in detail. Please join us to learn more and ask questions that are helpful to you. 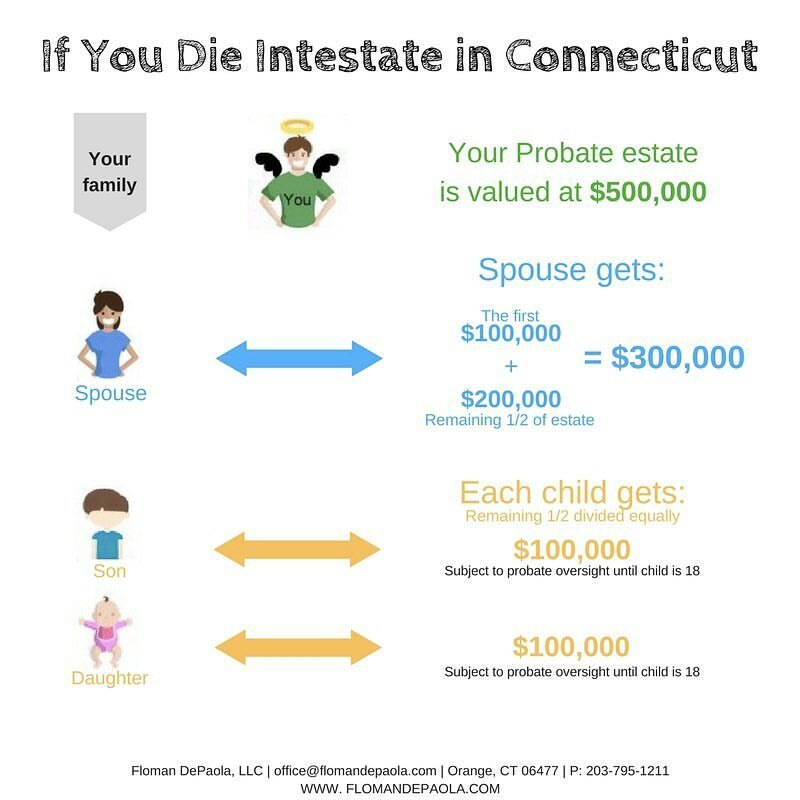 In March we will discuss the Connecticut Estate Administration and Probate Process. In April we will discuss the importance of Estate Planning in Connecticut. Topics include Wills, Revocable and Irrevocable Trusts, and Advance Directives, which consist of Durable Power of Attorney Instruments, Living Wills, and Health Care Instructions. Living Trusts are a popular planning tool. This class is dedicated to uncovering the myths and truths about Connecticut Living Trusts. In this class you will learn about questions to determine if a Living Trust is right for you. Finally, we’ll discuss planning and paying for long term care, and what government benefits, like Medicaid, are available to Connecticut residents. 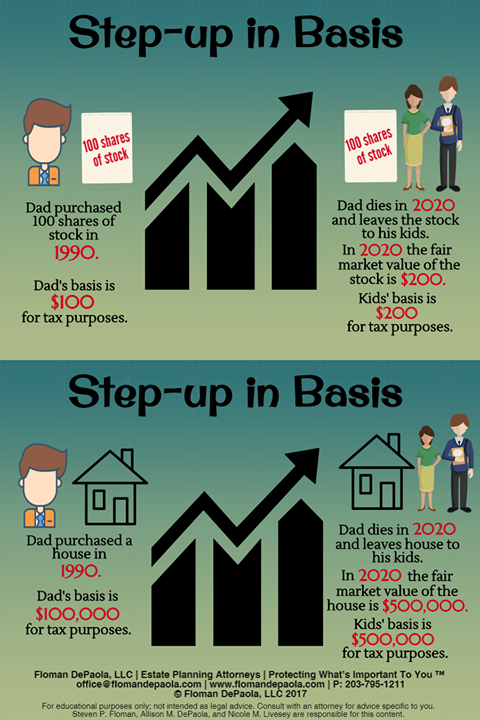 Connecticut Estate Taxes: What is the Step-Up in Basis? What is a step-up in basis for Connecticut Estate tax purposes? 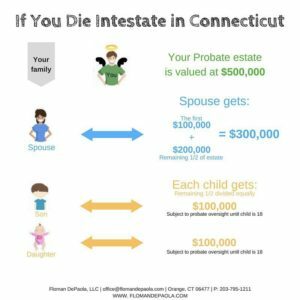 Many married couples are concerned about Connecticut Estate Tax planning and therefore are interested in a Connecticut Credit Shelter Trust. A commonly used tool used in Connecticut Estate Tax planning that aims to reduce or eliminate the Connecticut Estate Tax is the Standby Credit Shelter Trust. 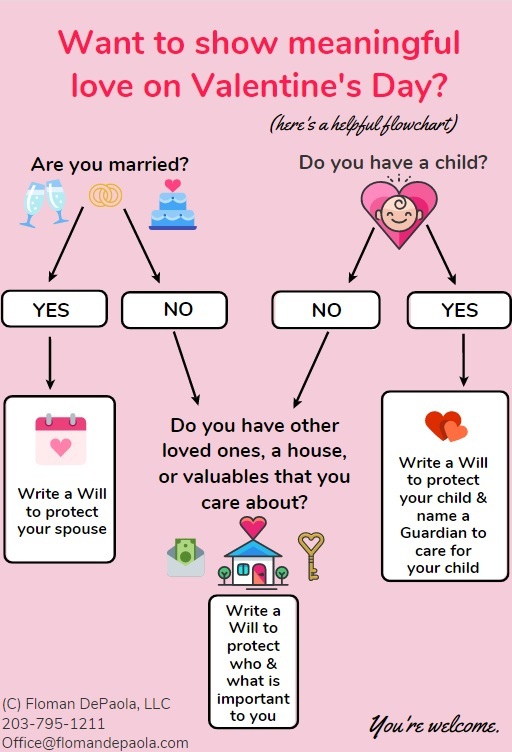 The chart, below, demonstrates how a Connecticut Standby Credit Shelter Trust may help married couples to achieve their Connecticut estate tax planning goals. 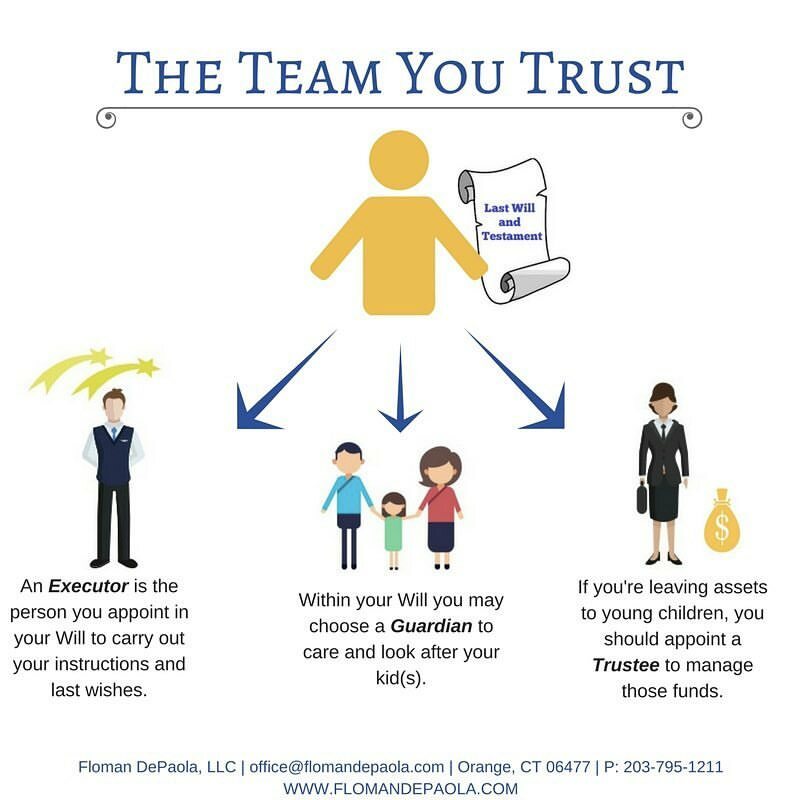 Before trying to achieve Connecticut Estate Tax Planning goals by using a Connecticut Credit Shelter Trust it is important to know the basics of both federal and Connecticut estate taxes. In sum, you may pass an unlimited amount of assets to your United States Citizen spouse without paying any Connecticut estate taxes. Assets that pass to non-spouse beneficiaries may be taxable depending on the date of death value of the assets. The federal estate-tax exclusion for 2017 is $5,490,000.00 (total) and the Connecticut estate-tax exclusion is $2,000,000.00 (total). How is a STandby Credit Shelter Trust Created? Standby Credit Shelter Trusts can be created through your Revocable Trust a/k/a Living Trust. The Revocable Trust states that when the first spouse dies all of the first spouse’s assets should be given to the surviving spouse, unless the surviving spouse elects to “disclaim” those assets to the Standby Credit Shelter Trust. The Credit Shelter Trust is “standby,” meaning, it is available for the surviving spouse to elect to use, if at all. If the surviving spouse doesn’t want to use the Credit Shelter Trust at that time, he/she do not have to. This gives the surviving spouse the opportunity to assess his/her financial situation at that time. WHO Is the beneficiary of the STANDBY Credit Shelter Trust? 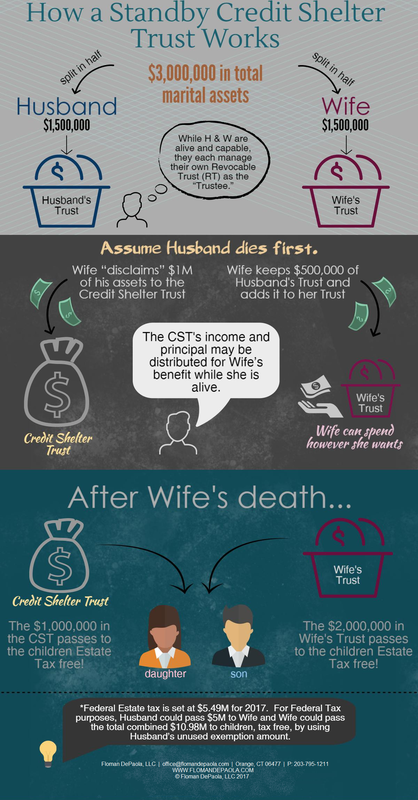 The surviving spouse is the sole beneficiary of the Standby Credit Shelter Trust during his/her lifetime. Although the assets were disclaimed by the surviving spouse, the surviving spouse may still have some use of these assets. However, the surviving spouse’s use of these assets is dependent upon the cooperation of an Independent Trustee. 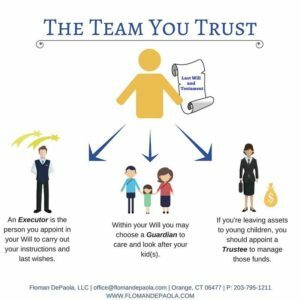 Who is the Independent Trustee? A trusted family member, friend, professional advisor, or a bank/institution would be the Independent Trustee of the CST. Why would a surviving spouse not want the assets? If he/she has enough assets in his/her name to meet his/her living expenses and wants to pass assets to other beneficiaries (i.e. children and/or grandchildren) without incurring higher estate taxes. The Standby Credit Shelter Trust is designed to “shelter” assets from the estate tax that would otherwise be payable when the second spouse dies if all of the assets were in the surviving spouse’s name. What if the surviving spouse doesn’t like or disagrees with the Independent Trustee in the future? The surviving spouse may replace the Independent Trustee. However, he/she cannot replace an independent trustee more frequently than every two (2) years. What happens after the death of the second spouse? After the surviving second spouse dies, any assets left in the Standby Credit Shelter Trust are distributed to beneficiaries (i.e. children, family members, friends). Know the facts before getting a new Durable Power of Attorney Instrument! In our October 2016 article we wrote about Connecticut’s new Uniform Power of Attorney Act and how it officially came into effect on October 1, 2016. Have you seen information circulating that intimidates you into acting immediately to update your documents in order to protect yourself and your family? We want to make sure you know the facts about how this change affects you and the Power of Attorney Instrument you may already have. Fact 1: Even though the law changed on October 1, 2016, if you have a Power of Attorney Instrument that was signed before October 1, 2016 it still remains valid. You should still review your document! Does it appoint who you still want to act as Agent for you? Fact 2: The new law allows for additional express powers to be added to the standard “form.” These powers are very beneficial for long term care planning and estate planning, and should be included in your new Power of Attorney document. These powers may already be in your current document! If not, you should consider updating your document to include these important powers. Fact 3: In most cases, a financial institution is now required to accept an acknowledged Power of Attorney Instrument, even if it is old and even if it is not on a form recognized by the financial institution. You do not NEED a new Power of Attorney Instrument to reap these benefits. Fact 4: If those who care about you think your agent is abusing the authority granted the Probate Court can be asked to look into what is going on. This added “checks and balances” is in place regardless of whether you have a new or “old” Power of Attorney. 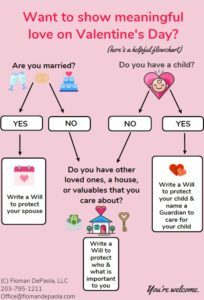 However, you can now include specific provisions in your new Power of Attorney Instrument which state your express wishes for who the Probate Court should appoint if there is an issue like this. It is highly recommended that you meet with a lawyer to review any documents you already have and determine if you NEED to execute a new Power of Attorney Instrument. It is never recommended that you sign up through the mail to get a new Power of Attorney, or any estate document, just because a flyer informs you the law has changed. If you do execute a new Power of Attorney Instrument, make sure it’s not the standard boiler plate form. It should be tailored to your needs and wishes! 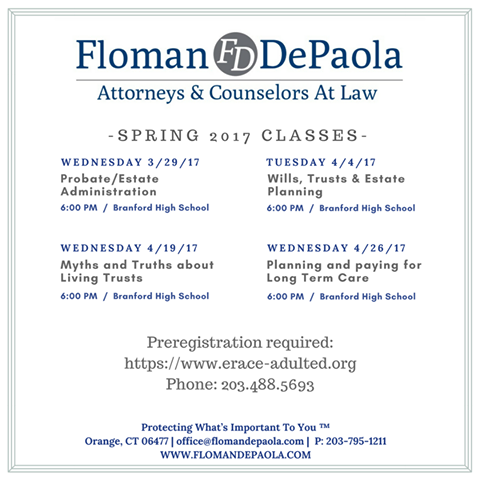 If you are interested in learning more about the how this change in the law affects you and your family, please contact the office. We would be glad to meet with you for a no hassle, no charge initial consultation, no matter how long it lasts. Happy Valentine’s Day from all of us at Floman DePaola! How will you be celebrating love today? Be Aware of Wire Fraud! In the process of buying, selling, or refinancing your home? BEWARE! Wire fraud is on the rise in Connecticut! There are some recent wire transfer scams occurring that the State of Connecticut is encouraging everyone to be aware of. The Connecticut Department of Banking states that it has recently received complaints concerning wire transfer scams, which centered on scammers attempting to redirect mortgage and payroll funds into fraudulent accounts. This means either you or your lender may be a target for this type of scam. For example, according to the Federal Trade Commission, it appears scammers have hacked the e-mail accounts of real estate professionals (lenders, attorneys, realtors) to discover details regarding real estate transactions and closing dates. As the dates approach, these hackers e-mail the mortgage company posing as the attorney for the buyer requesting they wire the money for the closing to a different account. This turns out to be a scam and the money is sent to the fraudulent account. Banking Commissioner Jorge L. Perez wants to ensure that financial institutions in Connecticut – which includes banks, credit unions and mortgage companies – are fully aware of this fraudulent scheme in order to protect themselves and prevent this from happening to them. At Floman DePaola, we feel that it is also important for the consumers to be aware that they can also be directly targeted and affected by this type of scam. • If you are wiring funds and receive a change in wire transfer instructions via e-mail, always verify the source, and always make sure the person you are sending the money to is legitimate. • Be skeptical of last minute changes regarding the wire transfer. Place a call directly to the person you had been working with regarding the transfer of funds. Most, if not all, attorneys do not change their wire instructions often, and will not do so right before your closing. This type of change should ALWAYS be verified by speaking with your attorney directly. Call the office number that you have been using from the beginning. The scammer may give you a different number or email address that may seem valid. • Always ensure your security software is up to date. Report suspected scams immediately to the Department of Banking Consumer Affairs Division, at 860.240.8170 or toll-free, at 1.800.831.7225.